Recently I had an occasion to see a huge, high resolution scan of that same piece of art and it literally took my breath away. This is a much lower resolution scan — but is sufficiently high to show the beauty of the work. I was stunned to really be able to see it, and to realize what Abbett had done. The insert above hardly does it justice, but at least you can get the basic idea. 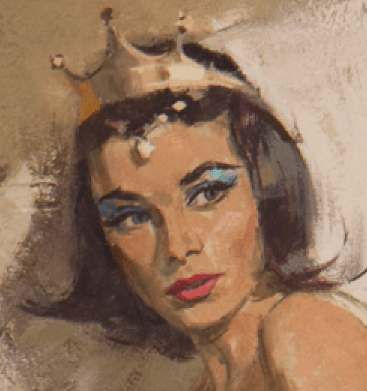 So many interesting choices — less exotic than many representations of Dejah — but the eyes, and the lips, and the quiet dignity, all work together to create an alluring quality that really transports the viewer if you let it. And now the full piece. Click to see it larger. For those unfamiliar — here is Abbett’s bio. Robert Kennedy Abbett (b. 1926, Hammond, Indiana) is an American artist and illustrator. 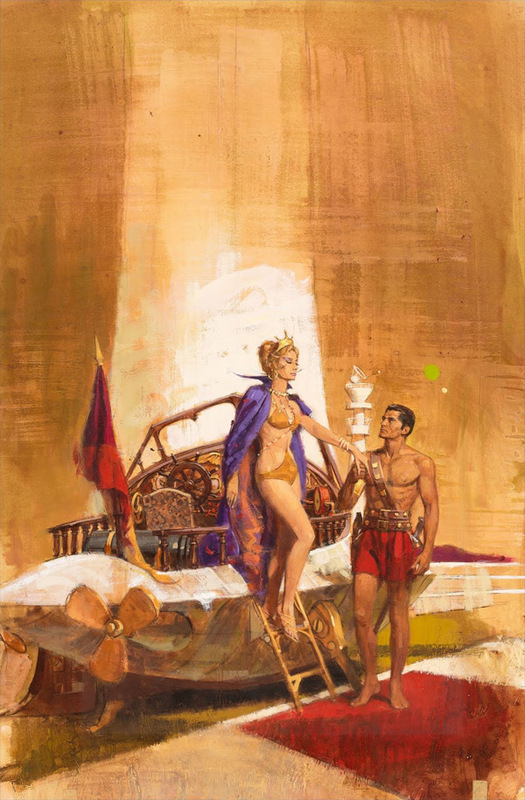 During the late-1950s, 1960s and 1970s, Robert Abbett illustrated book covers for war novels, detective novels, thrillers, historical fiction and science fiction. Today, Abbett is best known for his paintings of wildlife (in particular, dogs), wilderness, sporting, and fishing. Abbett is a graduate of both the University of Missouri and Purdue University. 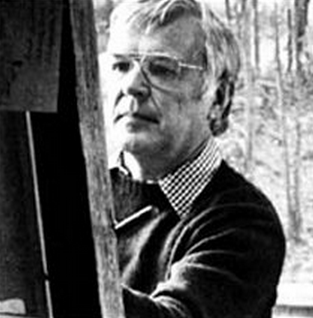 In 1953, Abbett moved to rural Connecticut where he built a house on an old farm (namely, Oakdale Farm). There, Abbett was inspired by the untouched wilderness and forests, and began painting what he has become famous for today: animals and countrylife. If you would like to learn more about Abbett — as with all things Burroughs — the place to go is EBRzine.com. Ah. Got it. Yeah, the one thing I was always impressed with in the SW movies was all the gadgetry and machinery/fliers/battleships etc, along with all the weird and cool beings and droids. The droids were the best. I too was a bit let down with the scout they came up with in JC. All the concept stuff I saw on the internet afterward was way better. No I love the speeder bikes. In fact the sb sequence in Return of the Jedi is one if the best. What I didn’t like was that with all of the concept artists Andrew Stanton supposedly hired the bet they could come up with for the one man flier was a speeder bike replica with wings glued to the side. Surely they could have come up with something more original or closer to the book. @Steve – Yeah, it looks like the designer of the movie fliers was influenced by “Avatar”, and trying to do something that looks more organic, or something, yet crossed with a touch of steam punk, unsuccessfully. I putter around with 3D animation programs myself and have struggled to come up with something that impresses myself to much degree. My first iteration looks much like a jet ski or wave runner, and my latest effort looks like a mini-F16 -ish wave runner. I was toying with something that looks more like a Star Wars speeder bike with wings, but not sure that is working either. @MCR – you didn’t like the speeder bikes in SW? Johno – you would be correct on that. In the vernacular “my bad”. It’s a beautiful cover art. I guess thought it depends on what the first cover you saw that you fall in love with since I’m still in love with Michael Whalen’s Princess and Thuvia covers. 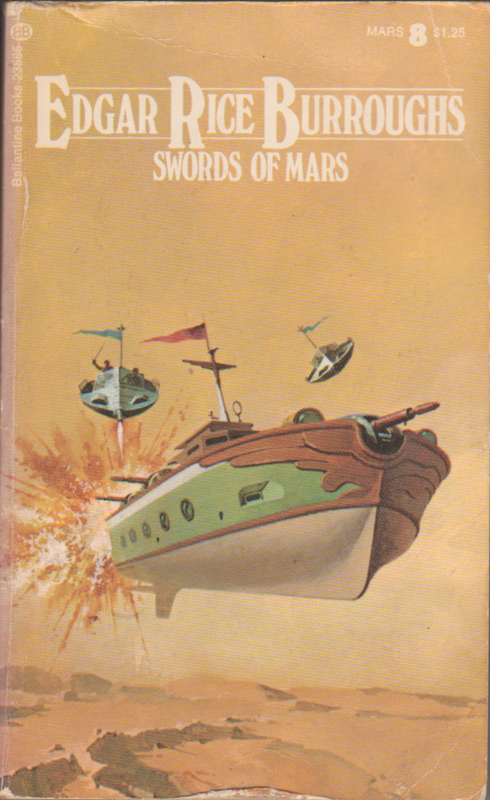 But Abbett’s cover art is the best and his one man fliers the best designed (at least they don’t look like speeder bikes with wings glued on them). 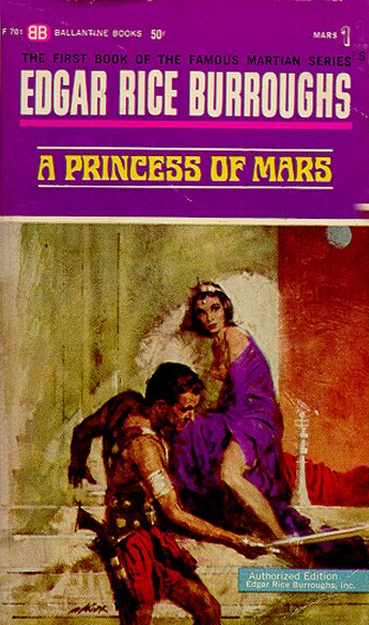 @Steve, I think that was just the cover for “Thuvia, Maid of Mars”. 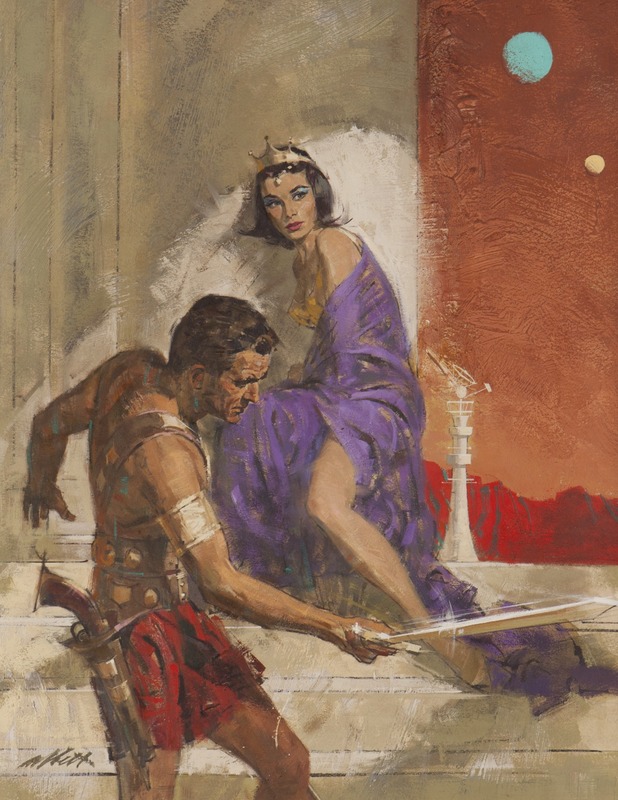 The girl would be Phaidor, blonde haired daughter (a princess) of Matai Shang, ruler and Holy Hekkador of the Therns, from the book. The Therns in the book were a blonde haired race. an lo! there behind Thuvia – an air boat! Not a dragonfly-winged ‘solar’ monstrosity that is obviously too fragile to engage in aerial combat, but a boat shaped boat that hurtles through the air.